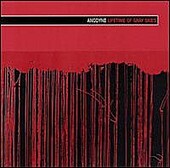 Creeping from the NYC underground, Anodyne's latest release showcases tons of muscular riffs and frenetic arrangements. Merging the attitude of Helmet and Unsane with the musical stealth of Candiria and Burnt by the Sun, this Brooklyn based trio will deluge your ears with an impenetrable wall of sound. Tunes like the driving and dissonant chug of "In the Desert Sound Proceeds Light" and the comically titled yet all-around iniquitous "A Mind is a Terrible Thing" are as effective as a punch with brass knuckles to the jaw; impact is quick and the results are staggering. If you dig Mastadon, Today is the Day, or any other band currently pushing the envelope in heavy music, Lifetime of Gray Skies would be worth checking out. Anniversary, The: Your Majesty Anonymous: Hill to Hill 7"